Volvo has signed a global commitment regarding diesel engine abandons and replacement by electric or petrol hybrid’s. This plan should be in effect completely by 2019 and India is not exempted. So Volvo has said Indian buyers to expect more electric or hybrid cars by end of 2019. However Volvo S60 will come with petrol only model in India. What are the upcoming projects for Volvo? Currently Volvo has aimed to sell around 1million units of electric cars most of which would be hybrid models. This mark has been set for 2025. Now Volvo has planned to introduce their EVs and hybrids in India. In India the X60 and S90 will get plug-in hybrids, that are petrol hybrid engines. Recently, Volvo cars announced that new models which will be launched after 2019 will have plug-in hybrids or fully electrified models. This means all the cars sold by Volvo will have some sort of electrification in them. In an aim to completely phase out diesel, this move by Volvo is a game-changer. Since Volvo has planned to sell 1 million units by 2025 hence India will get more electrified cars by this time. This welcoming news was confirmed by Charles Frump, the Managing director of Volvo in India. The last two cars sold by Volvo in India had been diesel models. Now they are switching over EVs. However, the S60 sedan will be a petrol only model and it will not get electrification updates. 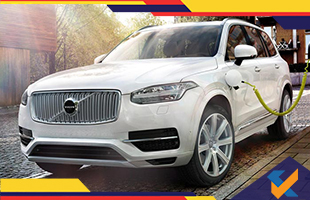 The recently launched SUV from Volvo called XC90 T8 is already available in hybrid plug-in model. It clearly indicates that all upcoming models from Volvo will somewhat get electric updates. By mid of December 2017, the XC60 SUV was launched in India which has acquired a good market in India. In most parts of Volvo showrooms in India, the XC60 remains sold out always. According to Frump the new XC40 will join the SUV family soon which will complete the family. Now Volvo aims to increase the sales further. With over 2000 units sold in India, they observed about 28 percent growth in sales and now they expect more after the completion of the SUV family. Now the XC90 and S90 are locally assembled and few parts will be made in India too. This would subsequently diminish the prices of the upcoming models. Upcoming models like XC40, S40, V40 will get compact platform soon. Frump has said that India is the biggest growing market for Volvo. They have opened a warehouse and are delivering faster parts at cheaper price. In upcoming years more cities will get Volvo showrooms. Ehst is the immediate action plan for Volvo to encourage more EVs? Currently Volvo plans to sell 6000 units per year for the premium SUV XC40. The new SUV will be available in July ehich woll directly compete with BMW X1, Mercedes-Benz GLA, Lexus NX and other like models. Volvo wishes to outsell these top models by acquiring the Indian market sales.